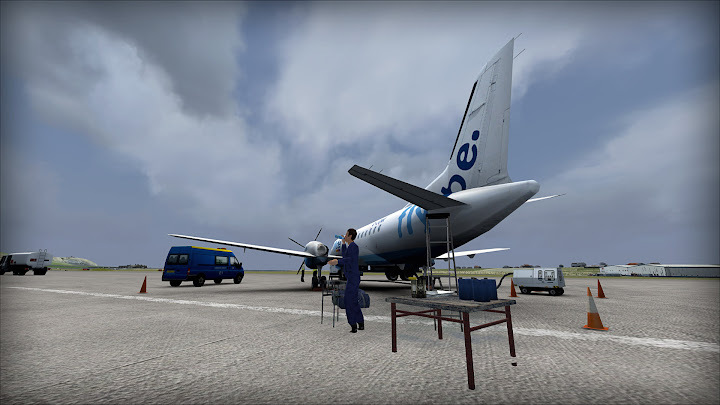 Sumburgh – airport in Shetlands. Look around, you will see sheep, gulls and gray ocean. This scenery lacks sheep. Apart from that – everything is perfect. Shetlands are known for their fine wool and cute Shelties (Shetland Sheepdogs). Economists pay more attention to the seas around the islands. To fisheries rich with mackerels, cods and herrings and to undersea oil deposits. Oil drilling mostly contributed to Sumburgh’s Airport development. For twenty thousands of Shetland’s inhabitants planes are the most comfortable and the fastest means of transport to Scottish mainland. Sumburgh Airport is also used by offshore workers getting to and from oil platforms located in the North Sea. Both factors contribute to traffic statistics – more then 120 thousand people passes through Sumburgh Airport annually. You should not be surprised that the apron in this scenery is filled with turboprops and helicopters. EGPB has two intersecting runways that are 1426 and 1500 meters long (1500m = 4922ft). The longer runway (09/27) is equipped with ILS on one end (27) and localizer on the other. There is also a VOR nearby allowing VOR approaches to all four runways. You might have noticed a shorter (550m) runway 08/26. It is a helipad and it is closed to fixed wing traffic. Northern taxiway reminds me of the Sumburgh’s military heritage – you should pay attention to taxi only on the southern half of this taxiway. The northern is out of service. Where / what to fly? Realistically – in commercial air transport twin engine planes are preferred for such locations – we are flying over water. So take a Jetstream or Beech 1900. Dash 8 or ATR will also be good. The biggest planes that landed in Sumburgh were Boeings 737 that diverted because of bad weather in Vagar (Faroe Islands). I’ve seen some photos of Lockheed Electra – the L-188 – four engine turboprop. If you prefer smaller aircraft – go for Twin Otter and Islander. Both types actually fly routes to and from this airport connecting it to other airfields of Shetland and Orkney. For a short period during NATO exercise RAF Hawker Hunters were stationed in Sumburgh. 1500 meter runway may be limiting for some passenger planes but it gives plenty of space for general aviation aircraft – just pick your favorite. The “real” routes connect Sumburgh with Aberdeen (75 thousand passengers), Edinbourgh and Glasgow (36 and 17 thousand respectively). Wikipedia’s 2012 list shows also routes to Inverness, Bergen (which is the hub for Norwegian offshore activities) and Kopenhagen in Denmark (not sure if these flights are not diverts from Vagar). Statistics also show more or less regular flights to Kirkwall (Orkney Islands) and Fair Isle nearby. 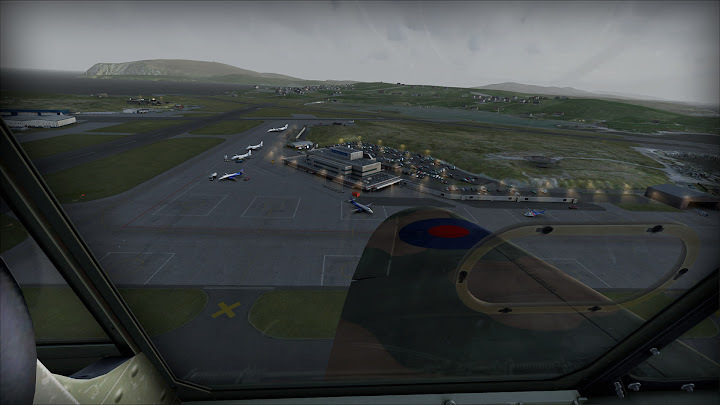 Sumburgh Airport was created as an add-on scenery for ORBX’s FTX Scotland scenery. Unfortunately it’s by now the only additional airport for Scotland. But there are some other airports that you can use to improve your experience and FTX Scotland includes airport enhancements. Scenery was developed by Lars Punkenburg and Martin Pahnev, known also as 29Palms. The fact that 29Palms was involved is an assurance of top quality. Soon I’ll publish my earlier reviews of their Twentynine Palms Airport and Skiathos X sceneries (that were written for my Polish language blog). The product page redirects to FlightSimStore where you can buy Sumburgh at a price of 29,95 AUD (Australian Dollars) – it is around $20 (US) or 20 Euro at current rates (August 2015). Additional 8 dollars (+shipping) will give you CD with installation files. 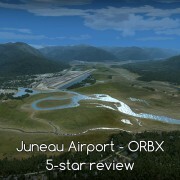 Installer works as it always do in ORBX’s products. When you run it – it asks you for order number, date and the product key. After validating your data it opens the proper installer that copies all files to your FSX folder (ORBX subfolder). 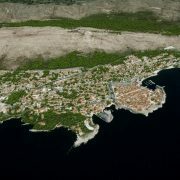 As with other ORBX products – check their website for updates and new libraries. 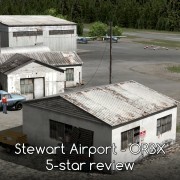 The manual uses standard template of ORBX files – it is a nice PDF file containing the basic information about the scenery, airport charts with stand numbers and configuration instructions. I review the scenery set up for me – will all features turned on and sloping runway selected (I don’t care so much about AI traffic). Very good. I’m sure that in a year or two we will see someone bringing something that will be much better but currently – that’s exactly what I expect from a scenery. Terrain slopes and bulges are clearly visible and naturally irregular. Mainland island is rocky and hilly – it’s highest peak reaches 450 meters – you will see this terrain characteristic in the scenery. I like the physical shape of this scenery and phototexture gives it an additional depth. One feature that I would like to mention is modelling and texturing of cliffs – it’s perfect. 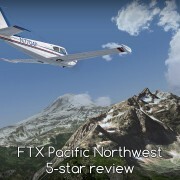 Often it is a weak spot of FSX sceneries. Not here – cliffs are beautiful. Lighthouse – of course the light is flashing and turning! The runway in this scenery is a masterpiece. 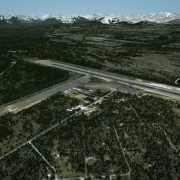 I know some FSX add-on airports that feature sloping runways and this one is among the best available. When you look from threshold along the runway – you will see how the asphalt follows terrain as it drops and rises. It gives an illusion of a real runway. Nice or very nice… but… Well, I can not say a bad word about this buildings. Shape – perfect. Textures – top quality. But for me the word “nice” does not fit here. Sorry – it is just my allergy and bias against this type of architecture. There is nothing wrong with the scenery of course. If I overlook my prejudice and focus on building I have to praise the texturing – it’s quality, details and signs of wear are extraordinary. I like the freedom to look around when I use this kind of sceneries. You know what I mean – it’s ok to just walk around the airport and everywhere I go – the models and textures are maintain the quality. It changes box like and front oriented FSX world into something real. Whole airport is covered in 3d grass. The scenery employs two kinds of volumetric grass. Most areas are covered with what I will call a “dense grass”. It looks like a set of textures that give the impression of deep grass but lack detail. Some parts – especially places where the grass is higher – are covered with more “traditional” 3d grass where you can see single blades. It is much better looking but I presume that using the latter extensively would kill framerate. It seems that “dense grass” is a substitute. 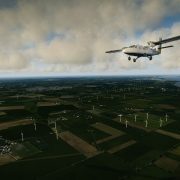 I know that we need to accept FSX limitations. I am glad that some developers are trying to walk around them and even use multiple techniques just to avoid covering the airport with a flat grass texture. 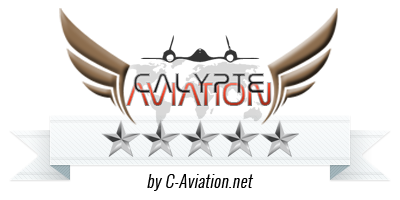 I am writing this review just after flying from Phoenix (Arizona, USA). I use a great scenery for this airport, but… I can’t help but notice the absence of airport buzz. It’s empty. I was taxiing around one of the largest airports in USA and it was like driving on a mall parking lot in the middle of the night. Now I am writing about Sumburgh and this flight from Phoenix makes me more sensitive to the way how ORBX and developers from 29Palms introduced life to this scenery. First – there are planes and helicopters placed around the airport. Do not worry – you will find plenty of space to park your aircraft even if you are flying online with some friends. But you will park you plane among other even if you are flying alone. Second – you will see people around you. And the third thing – in real world there are lots of small objects, tools, crates, boxes and carts. You will notice these as well. People require more attention from the reviewer. By now I know that both 29Palms and ORBX are capable of doing advanced animated men and women. That is what you will find here – for example – a mechanic who is doing some maintenance and then stops to take a sip from a bottle. When I write about small objects – I mean really small. For example – a sign on the road in front of airport. It says that you may park here for 30 minutes. And we can read it. In FSX. Nice. There are also some animated birds in this scenery (not really something unusual in scenery) and animated cars (in this case – I find them better – more complex – then normal car animation in FSX scenery). 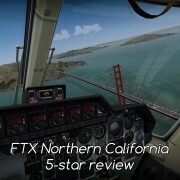 I rarely write about the night in FSX. I don’t like flying at night – in my opinion most sceneries look bad at night – but thanks to places like Sumburgh I slowly change my mind. It is different here because of what they did with lights. This are 3d lights that look like the lamps were lighting fog. Maybe the effect is a little bit too strong – it really looks like it was really foggy here at night, but aesthetically – they are great. Foggy impression is not that bad if you consider where this airport is located. Fog during night is a common phenomenon here. There is one thing that I do not like about night lighting. It is a common problem in FSX – library objects are usually dark. It looks strange if you have a plane standing under a lamp and it’s wings and fuselage are dark while the ground underneath is light. I was really shocked by the low impact this airport had on my system. In terms of performance – it’s GREAT! I am not objective and I do not try to be. Factors influencing my opinion do not have to be connected with developers work at all. I took some time to decide if it should be 6 or 5. Great sloping runway and lack of any flaws (apart from the sheep) suggested 6 but I was not sure if this product is so much better then other 5 star sceneries to justify the 6th star. At the end – I am pretty sure that it was the architecture of airport that made my ming. Maybe if this airport was picturesque it would be 6******. I describe my thoughts in summary so that you understand that this is a great scenery. No matter if it’s 5 or 6 – I love to fly here and I do it often. 5 stars is the undoubtedly deserved. I recommend this scenery strongly. I consider 20 dollars or Euro a standard price for such an airport. it is a good price.